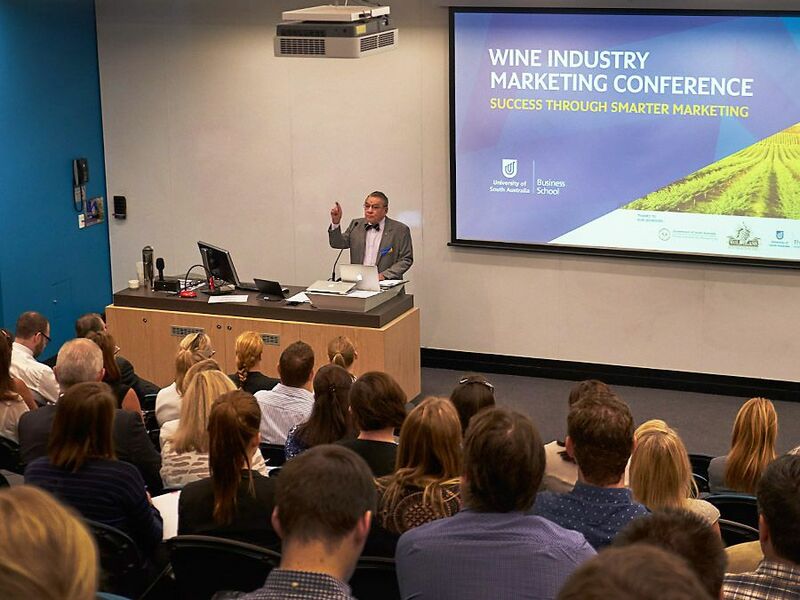 I attended the Wine Industry Marketing Conference at Uni SA late last month. Wolf Blass opens the conference. Photo : Milton Wordley. Even though I don’t produce, market or sell wine, I’ve had a long time interest in the world of wine. I found the day extremely interesting. One of the sessions I found fascinating was Dr Liz Thach’s. 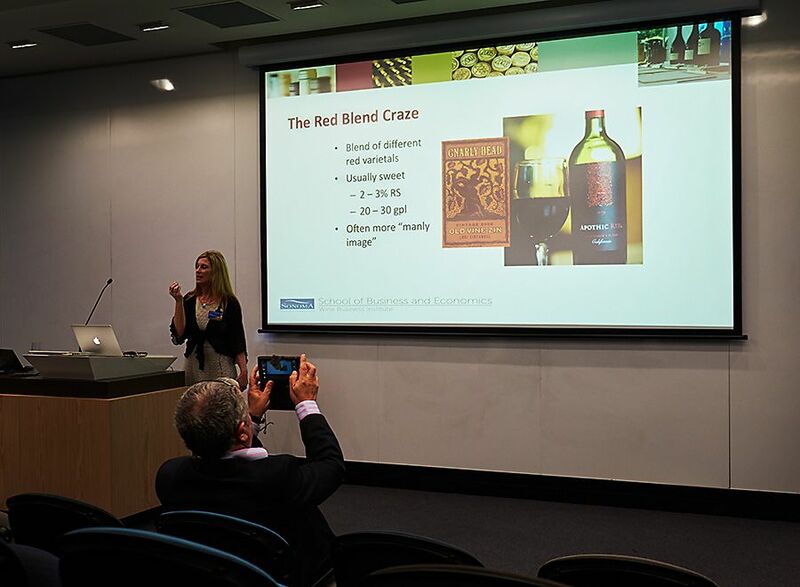 I thought her perspective on Australian Wine’s position in the international export world very interesting, especially in light of the recent release of the current export figures. 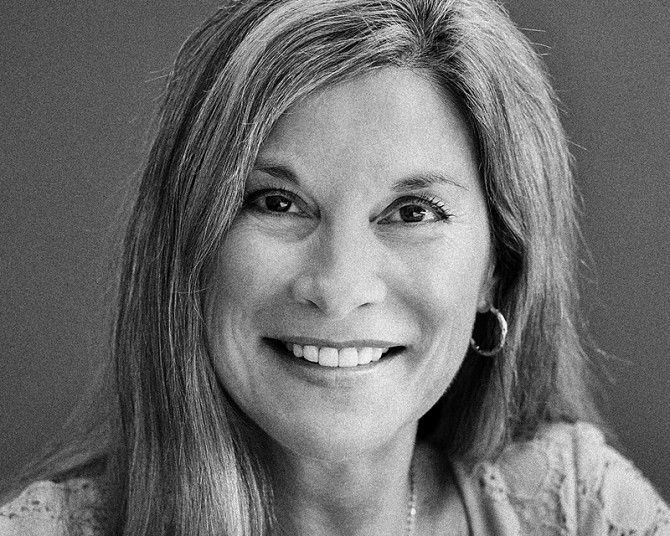 Dr Liz like a lot of people in the wine business got bitten by the wine bug years ago and gave up a successful career in HR in a number of Fortune 100 companies. If you are in the wine business and were not at the conference you might find Dr Thach’s thoughts on wine marketing interesting and if you were there you might find them worth revisiting. 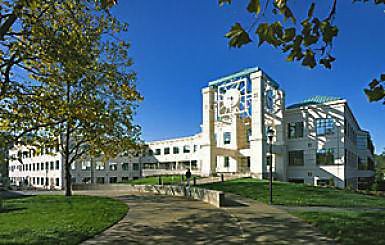 Sonoma State University : Photo supplied. My title is Distinguished Professor of Wine and also Professor of Management, so I teach both wine and management at Sonoma State University. Our wine business program started in 1995 and is funded by the State of California and industry donations. We offer a variety of degree options: Bachelors in Wine Business, a Wine MBA, an online Wine Management Certification and a variety of four hour professional wine business courses for industry professionals. When I first started teaching in 2000, there were no text books on wine business. Therefore I started using articles, such as those published by Wine Business Monthly, but after three years I got really frustrated and decided to write my own book. I knew that I couldn’t do it all myself, so I decided to publish an edited book, with chapters written by different experts in the field. Liz and Tim’s book : Wine a Global Business. It was then that I bumped into Tim Matz at a wine conference. He was working for Beringer at the time and offered to help me. 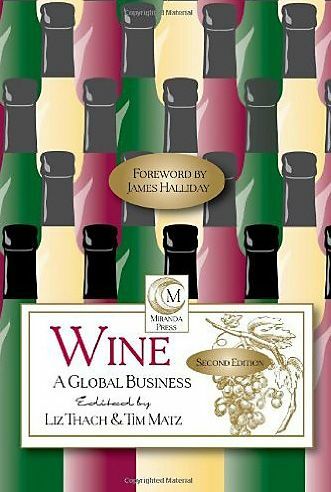 That first book is called Wine – A Global Business, and each chapter is on a different aspect of wine business, such as the business of viticulture, the business of oenology, marketing, sales, distribution, finance, accounting, legal issues, etc. Peter Gago wrote part of the business of oenology chapter, and Tim asked James Halliday to write our forward. The book has over 40 authors in it and took two years to complete. Now that I’ve published a total of eight wine books, I’ve come to realise that editing a book is more difficult that writing one, because you have to take many different ‘voices’ and rewrite them in a coherent fashion for the reader. You were an HR executive in big business – why wine transfer to wine ? Wine has always been my passion, but I worked for over 10 years in Fortune 100 companies in technology, telecomm and energy, before pursuing a career in wine. I’m a fifth generation Californian, so when I went to college in the Bay Area, I did what many college students do – traveled up to Napa Valley to go wine tasting. Once I arrived, I fell madly in love with the wine industry. I was entranced by the whole process, including the beauty of the vineyards, the old wineries, the people who transformed the grape into a delicious beverage, and the art and ceremony of tasting something that was crafted by Mother Nature, science, and the human touch. In California, we call this ‘getting bitten by the wine bug.’ Some people just fall madly in love with wine and I was one of those people at a very young age. Liz and her husband Mike at the ‘Hill of Grace’ restaurant while here for the conference : Photo supplied. I graduated with a degree in English, because I’ve always enjoyed writing. My first job was as a recruiter in New Mexico, where I met my husband. 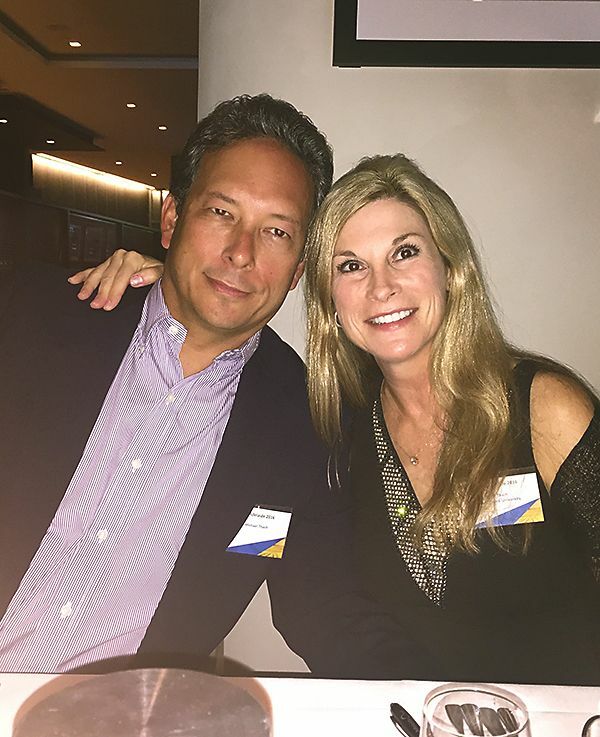 I converted him to a wine lover and when he got a job in Houston, Texas, we started taking wine tasting classes together at some of the local restaurants and wine shops. We also traveled to Napa and Sonoma, whenever we got the chance, as well as vacations to wine regions in Europe. We actually came to Australia in 1995, because I have relatives who live here. We had a great time wine tasting in the Barossa and McLaren Vale that year. Along the way I got a Masters in Business Communications and a Ph.D. in Human Resources at Texas A&M University. While there, I visited Messina-Hof Winery in College Station almost every week to attend the wine tastings and even helped with harvest one year. We also started visiting Texas wineries whenever we had a chance, as well as wineries in New Mexico, Arizona, Idaho, Colorado, Oregon and Washington. This was because I have relatives in all of these states, and whenever we go on vacations, we visit wineries. Now, I have a goal to visit a different US state each year to check out their wineries. So far I’ve visited wineries in New York, Virginia, Missouri, Indiana, Iowa, Hawaii, and Wisconsin, but have many more to go! I’ve proud of the fact that the US has so many small family wineries. It is a great entrepreneurial business that helps promote agriculture and tourism. Eventually I transferred to Denver, where I worked three years as Director of Executive Development at US West. Then in 2000, I saw this position advertised online by Sonoma State University. They wanted a Ph.D. in Human Resources, with industry experience and a background in wine. This job had my name on it, so I applied and never looked back. When it was suggested that you study for your MW, your first reaction was, “but I only have a Californian palate”. Can you describe your MW journey? When I attended one of our book launch parties in Napa Valley in 2005, I was approached by two MW’s, Peter Marks and Tim Hanni. They suggested that since I could write about wine, that I should consider applying to the MW program. At the time, I laughed, because I thought I could never be an MW, primarily as my palate was used to drinking California wine. However, I love a great challenge and so I applied and was accepted. That started a five year process that was both thrilling and aggravating at the same time. The MW was more difficult than my PhD, because it is primarily a self-study program and you have to depend on self-discipline to make the time to study. When I started, there were only seven class days per year and the rest of the time you had to study on your own and find people to taste with you. Now the program has more support elements, but it is still rightly called “the most rigorous wine exam in the world.” After two years of study, there is still around a 90% failure rate the first time people sit the exam. 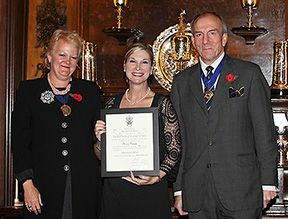 Dr Liz at MW Ceremony in London : Photo supplied. It is extremely rare to have someone pass the whole four day exam the first time they take it. I was fortunate to pass the theory portion the first time, but it took me two more attempts to pass tasting, which includes identifying 36 wines blind. After the exam, there is one more year of writing a research paper. I was thrilled when I received the phone call in May of 2011 that I had passed. It made me the first woman in California to pass the MW and the seventh in the US. You now teach a seminar entitled ‘Palate Diversity. Can you comment on the concept of palate diversity around the world? Basically, what I learned is that we each have a unique palate, similar to our unique fingerprint. Our palate is based on our genetics and upbringing. Some people have more taste buds and a lower salvia flow rate and this creates a heightened sensitivity to taste and temperature. Even within the same family, you can have different permutations of tasting sensitivity. Therefore, certain wines can actually be painful for some people to taste, especially if they have rough tannins, high acid or high alcohol. Then, depending on the culture in which you grew up and the types of food/beverage you are used to drinking, this changes the situation further. Add smell to the equation, and the fact that we all have different levels of ability to identify aromas, then it becomes even more complicated. 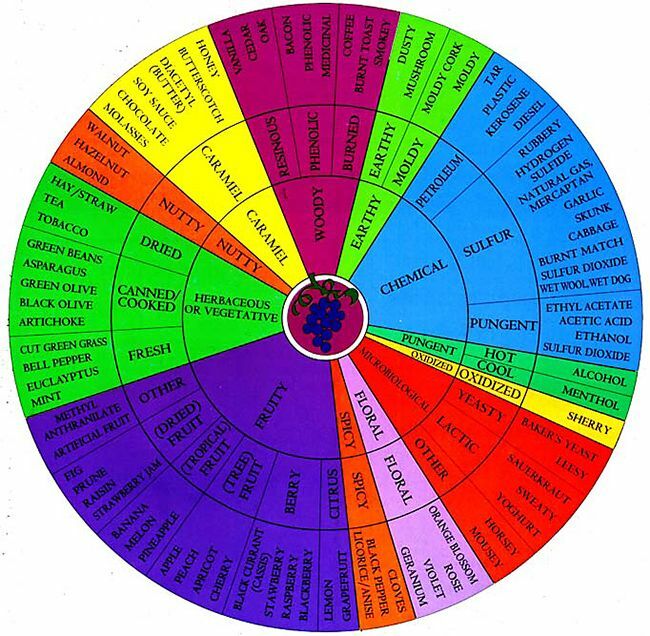 Wine Aroma Wheel from UC Davis. Photo : The Wine Cellar. Even though this sounds complex, if you take the time to understand your own palate, and then begin practicing with different tastes and aromas, eventually, over time you can learn to identify different wines in a blind setting. 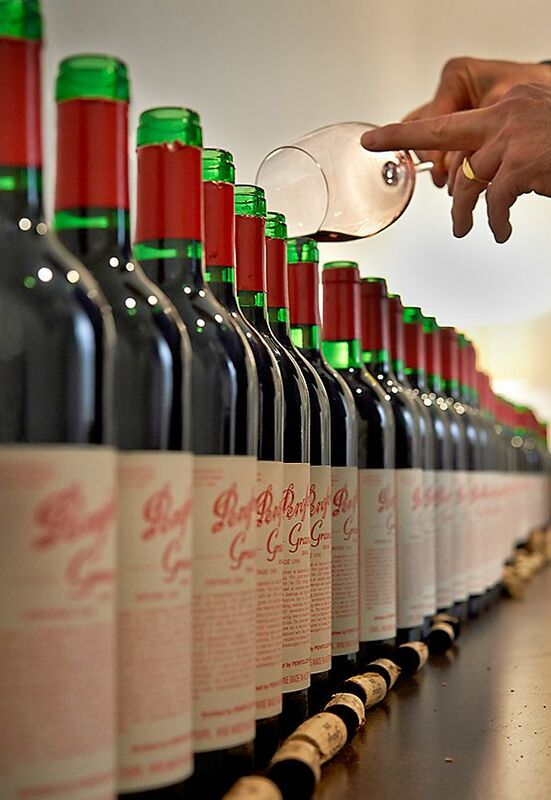 Because of this, it is possible to train anyone to become a professional wine judge once they understand their own palate and devote the time and dedication to improving. When it comes to a national palate, even though there are always exceptions, I do believe certain cultures become attuned to specific tastes in food and beverages. Over time, people living in these cultures come to crave these tastes and aromas, just as we all may miss home cooking from our own country. Because of this I do believe there are some cultural palates when it comes to wine. For example, in France, Spain and Italy, where they have very old wine cultures, wine has traditionally been used to drink with food. Therefore the wines are less fruit-driven, so as not to compete with the food and have higher acidity to cleanse the palate after each bite. The American palate is different, since many of us didn’t grow up with wine as part of our culture. Wine has been more of a beverage to sip and enjoy. I also think that Americans, who have grown up with Coca Cola and sweet fruit juices, prefer their wines to be fruitier and a bit sweeter, though most will not admit to this. Just think of the wines that are popular in the US market today. Red blends with a touch of sugar, NZ Sauvignon Blanc that also has a little bit of residual sugar, and Prosecco which has bubbles like Coca Cola and is a little sweet and fruity. One thing I like to teach my students is to respect palate diversity. We are all different, but anyone can learn to become a wine judge if they want to. However, just because someone likes a wine that you don’t, you should not look down on them. I really dislike wine snobs and believe that all wines have a purpose in the world. Some are designed for pleasure to share with friends while watching the sunset, others are made to match with food, and still others are collector items to preserve in a cellar before analysing with like-minded souls. Wine marketing: Can you give us an example of a new launch that has worked and why ? E&J Gallo’ Apothic brand : Photo supplied. The easiest way to answer that is to look at a large brand vs a small boutique brand. There are successes in both and they use completely different strategies. Let me start with a large brand and company. 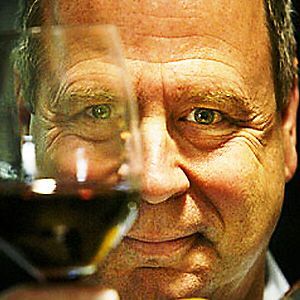 E&J Gallo is one of the most brilliant wine marketers in the world. When they decide to launch a new brand, they start with the consumer in mind. To begin, they conduct multiple focus groups and talk with consumers about what they want. Then they create a brand to meet a specific market need. Apothic is a good example of one of Gallo’s brilliant brand launches. They tapped into a desire for a big, concentrated, ‘manly style’ of red wine. 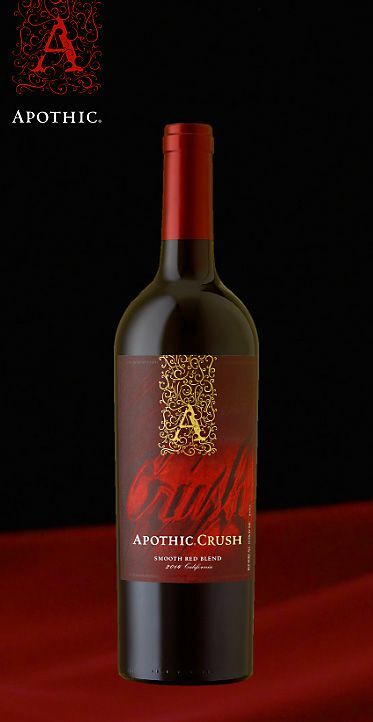 It has a black edgy label, looks a bit gothic, is slightly sweet and has a higher alcohol. It retails for around $12.99, but you can get it on sale for $9.99. So it’s the right price point to be considered premium and not cheap. The other thing that Gallo is able to do very well that very few competitors can match, is wine distribution. They have an incredible distribution team and in order to be a big wine brand in the US, the only way to survive is to have very good distribution partners. Gallo has that and they work with those distributors to make sure that their brands receive top placement in retail. They also have excellent advertising, using both traditional print and online media to support the brands. Within a few months, a new brand they launch is in every store and the promotions they use ensure it catches on very fast. So let’s move to a smaller brand that doesn’t focus on mass market, but is targeted at a highly discerning wine enthusiast market. There are many good examples, but I’ve been very impressed with Bedrock Wines, because I witnessed Morgan Peterson launch this amazing brand. 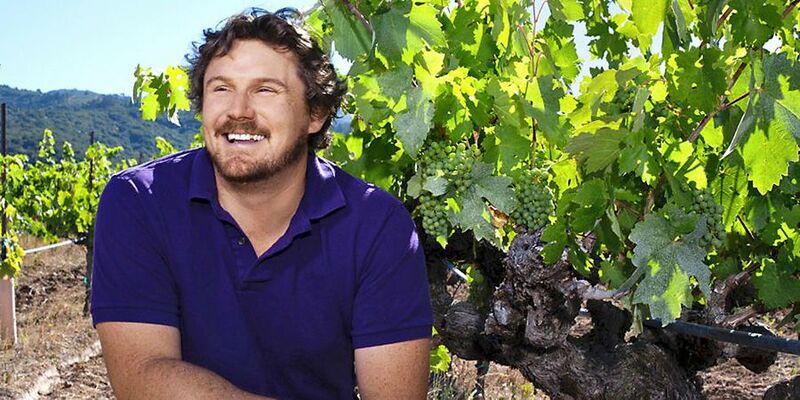 Morgan grew up in a winemaking family and he developed a passion for California heritage vines. Just as in Australia, heritage vines are old vines that were planted many years ago, often over 100 years in age. Morgan was concerned that some of these ancient vineyards were being torn out and he wanted to preserve part of California’s history. He also believes that these old vines create a much more compelling, complex and concentrated wine. 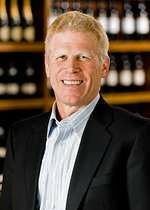 So he decided to launch a brand, focused primarily on old vine Zinfandel, but also includes other ancient vineyards, including field blends, cab blends and even old Semillon. Morgan Twain-Peterson at Bedrock Wines in Sonoma : Photo supplied. To launch the brand, he reached out to friends and family on social media and asked for help in designing the label. People from all over the country read about his desire to rescue old vines, and participated by helping to select the best label and also the name of the winery – Bedrock. People became involved and committed to the brand before it was even launched. So when the first few cases were ready to sell, he contacted his online friends and got the word out. He built the brand slowly, basically through a soft launch, and then began doing the ‘shoe leather’ part of wine sales. This means calling upon distributors, retailers, restaurants and key people he wanted to taste his wine. Over the course of a couple of years he built up the brand. Eventually the wines started receiving high ratings with wine critics and were written about by the press. Now the brand is selling well, priced at the $50 to $60 level. He keeps production small and maintains the brand story. A key part of his success is this brand story; helping to preserve these antique vineyards which are part of California history and produce such rare and exquisite wines. It is very emotional, and I’m one of those people who get caught up in that story and the desire to preserve those beautiful old vineyards. With your background in business, do you have any tips for small winemakers combining their passion for winemaking with the realities of the business side of things. There is that old saying, which is I believe is true: “It’s relatively easy to make a beautiful wine, but the hard part is selling it.” In this way, wine is similar to art. There are many talented artists, but not all manage to find an agent to help them sell their art. In the US, if you are under 5000 cases, and you’re willing to put in some time to hand sell your wine – do the ‘shoe leather’ stuff, hit the payment and get people to taste your wine, then you can most likely sell it direct to consumer from a cellar door. Also, in certain states, such as California, local wineries can sell direct to restaurants and grocery stores, so this helps. Once you get larger however, it is more complicated because you have to find a distributor. It’s just as difficult for small unknown US brands to find a distributor in the US as it is for foreign brands. Currently there are only around 600 distributors in the US and most are completely overwhelmed with the amount of brands they stock. They aren’t necessarily looking to take on new brands, unless they’ve received a top score of 94 or more. And then if you are a foreign brand, you also have to find an importer which can also be challenging. It is not an easy business. First, an incredibly good wine. Second, a compelling, and often emotional, brand story that draws people to the wine. The brand story should be supported by good promotional imagery (packaging, social media, PR, etc). Third, good old fashioned ‘shoe leather’ sales. This means pounding the pavement, shaking hands, tasting people on your wine, and getting the word out – all with the consistent brand story and a passionate person behind it. Fourth is consistency in quality, message and keeping the brand fresh with new stories and insights. Along the way if you happen to get a high score in a top wine magazine, that always helps too. 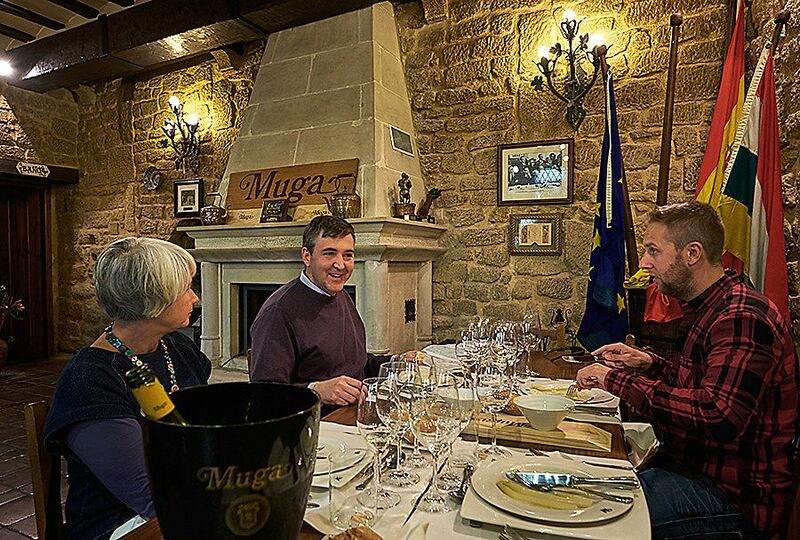 Finally, most successful brands seem to share the wealth by giving back to their community via charity or other means, and also becoming involved in local wine associations to help other wineries in their region. By adopting a philosophy of a ‘rising tide lifts all boats’ they help create positive press and goodwill for their region and brand. 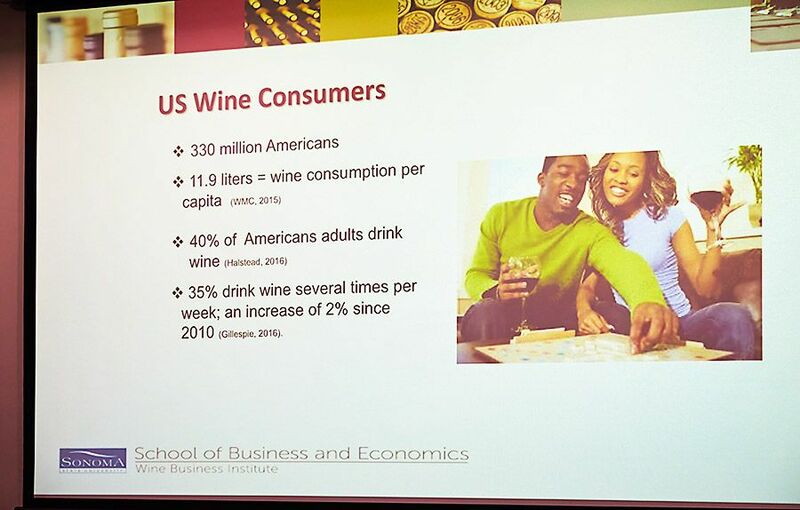 In your presentation you mentioned the issues the Australian wine industry was facing in the US. You suggested a new campaign based on regions or even a new slogan – can you tell me more. I love Australia and I want Australian wine to succeed, because your wines are exquisite. 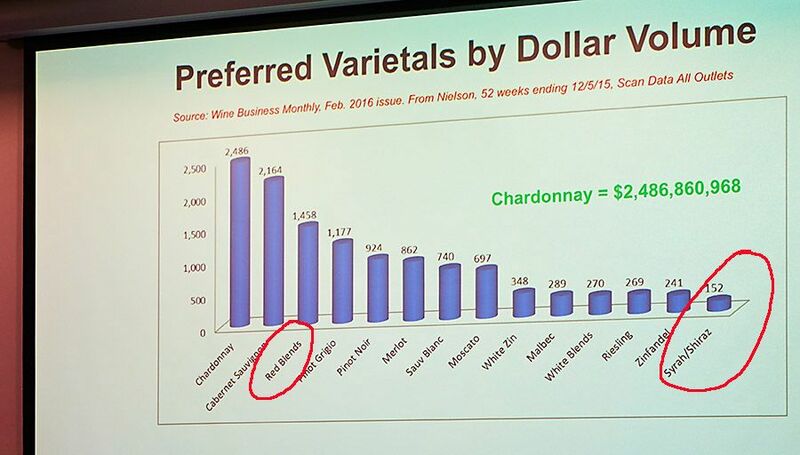 But in the US brand Australia has really become tarnished lately, with most Americans perceiving it as inexpensive bulk wine. Only the somms and wine experts know about the beautiful wines that you make. Robert Joseph found it all very interesting. Grabbed a seat front and centre capturing many of the slides on his phone. Photo : Milton Wordley. There are only really two choices. Second is to resurrect your ‘regional hero’s strategy,’ which really never came to fruition in the US. A regional focus seems to make more sense, because you don’t see other fine wine countries using a country strategy – they use region. 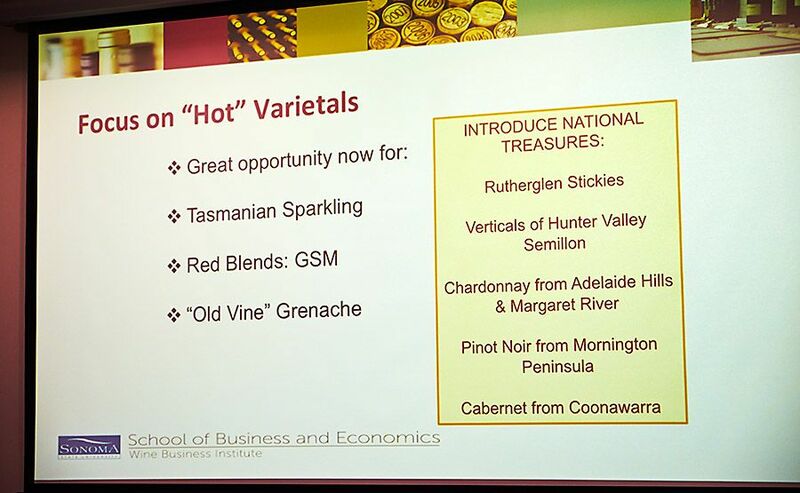 Hot varietals Australia might like to take on board in planning wine exports to the US. For example, in Europe, you don’t see Brand France or Brand Italy, you see Burgundy or Tuscany. Even in the US, you don’t see Brand America for wine, you see Napa, Sonoma, or the Fingerlakes. So Australia needs to rethink Brand Australia and focus on promoting its distinctive and amazing regional wines. Then once you decide on a strategy, develop a compelling brand message with a catchy logo. Think ‘The Douro Boys’ from Portugal, or something along those lines. The Douro Boys : Photo supplied. Once the message is developed, plan a road trip across America to highlight ‘the new taste of wine from the land of Oz.’ Hit all of the major cities such as LA, San Francisco, Chicago, Dallas, Houston, Miami, NY, Washington DC and others. Do tastings for both trade and consumers in those key markets, and create some positive buzz. 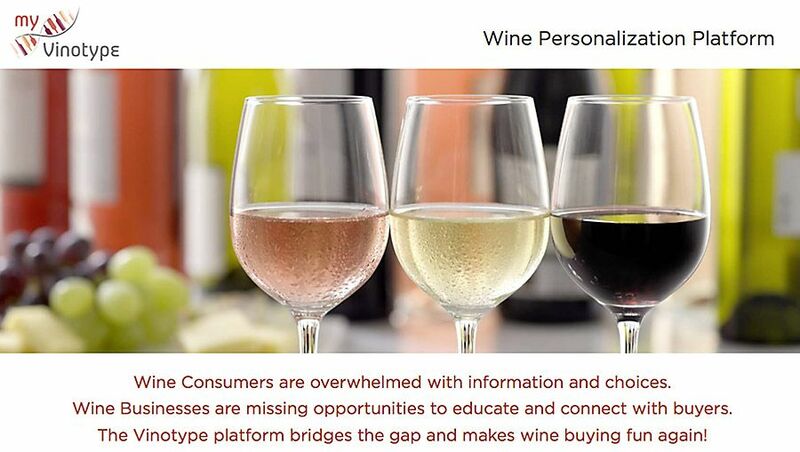 Build relationships with key distributors and consider partnerships with US wineries. Australia has a long history of producing truly amazing wines. It is time to bring them back into the spotlight so that people outside of Australia can remember – or taste for the first time – your exquisite national treasures. Do you see any new trends in wine ? Wine has now become a fashion trend in America – it didn’t used to be but now it is. American preferred varietals. Red blends at #3, Shiraz at the bottom. Right now there is a buzz or a whisper about Grenache . Sometimes you hear the whispers and they don’t play out, so I don’t actually know if it will play out with Grenache, but Grenache is getting more popular. Especially old vine Grenache. 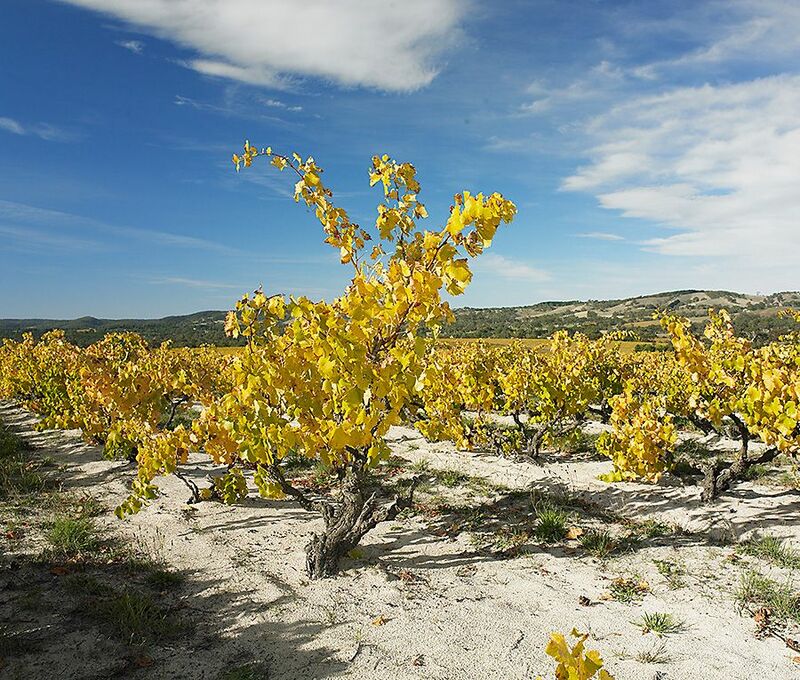 Red blends and Rhone varietals are really popular , especially Chateau Neuf and people are coming at Grenache that way – but they are also wanting to know more about Grenache from other places. Old vines in general are getting more popular. People are interested in the history and that preservation story. Conference organisers Larry Lockshin and Justin Cohen. You have a small ‘hobby’ patch of Pinot and Sauvignon Blanc in Sonoma. They seem like odd bedfellows ? 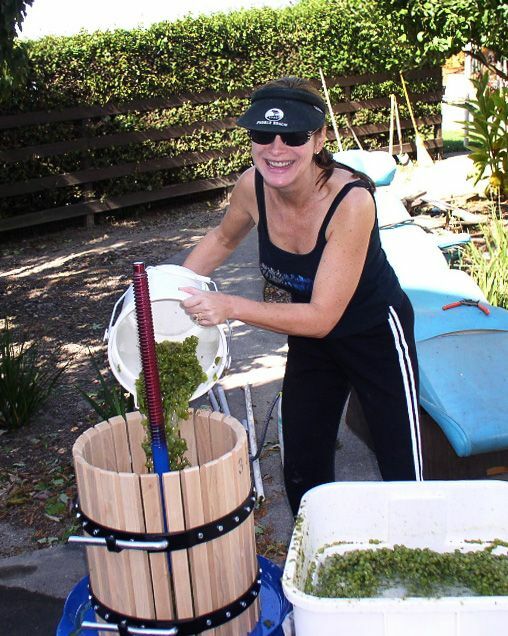 Liz Pressing Sauvignon Blanc at home : Photo supplied. I call myself New Zealand – They have Pinot and Sauvignon Blanc, so does Sancerre. My Pinot is a Dijon clone – I live in a cooler part of Sonoma – the Sonoma coast, its called Petaluma Gap and its going to be a new appellation soon. I’m up on a little hill, so I get fog and then I get sun. I have only 120 vines, ninety are Pinot Noir and thirty are Sauvignon Blanc. I planted it just for fun, so I am truly a ‘garagista’, I make wine in my garage. I planted the Muscay clone of Sauvignon Blanc which is aromatic. This has done beautifully, its got lovely acid, I won best of class a couple of years ago . Gold in the amateur wine competition. I harvest my Pinot around about September and Sauvignon Blanc, not till the end of October because it needs more heat and takes more time. I always say they are growing Sauvignon Blanc and Pinot in Sancerre and they are growing Sauvignon Blanc and Pinot in NZ, so I’m growing Sauvignon Blanc and Pinot here in the Petaluma Gap. I’m the only one who is growing Sauvignon Blanc here at the moment. I want to go on record as saying I love fine Australian wines. Peter Fraser : Yangarra Estate, McLaren Vale.